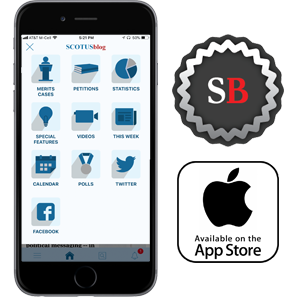 SCOTUSblog is – as we explain in more detail elsewhere on the site – an impartial, journalistic entity that seeks to provide readers with objective information about the Supreme Court and its cases. 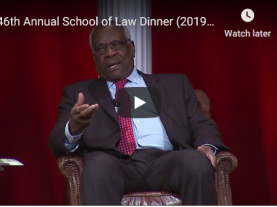 At the same time, we are in a somewhat unusual position as a news outlet: our publisher, Tom Goldstein, and his law partners regularly appear before the Court, and his firm provides essential financial support for the blog. To avoid any appearance of a conflict of interest in our reporting, we have adopted a number of policies intended to create a “firewall” between the blog and the firm. Most notably, although Lyle Denniston – an independent contractor who is not an attorney and has never been employed by the firm – once covered the firm’s merits cases for the blog, neither he nor anyone else employed by the blog does so now. But even that arrangement is not ideal for many cases. That’s because many of our merits cases are covered by experts in the field. And while we don’t want those experts to bring their personal views on what the law should be to the table, we do want our experts to call them as they see them – providing our readers, for example, with an objective assessment of which side has the stronger arguments, what the broader implications of the case may be, and (if they feel comfortable doing so) which side seems likely to win. This approach works well for cases in which the firm is not involved. However, it puts us in a tough position for firm cases. If our coverage, even coming from someone not employed by the blog or the firm, suggests that the firm’s side is likely to prevail, it may seem like the blog is spinning the coverage of the case to favor the firm. On the other hand, coverage suggesting that the firm is likely to lose may raise the hackles of the firm’s clients in the case. To address this problem, we are adopting a new policy for all merits cases in which the firm represents a party. We will continue to provide coverage from an expert not employed by either the blog or the firm. But that coverage will not contain any assessments or judgments about the relative strengths of the parties’ arguments, which side is likely to prevail, or what the case’s broader impact might be. Instead, previews of each case in which the firm represents a party will focus on the facts of the case, the procedural history, and a description of each side’s arguments. Argument and opinion coverage will be primarily descriptive. And in our daily round-up of Court-related news, we will of course continue to link to outside coverage of and commentary on those cases, no matter which side they favor. The firm has two cases – Dollar General Corporation v. Mississippi Band of Choctaw Indians and Heffernan v. City of Paterson – in which it is waiting on decisions. We’ll follow this policy when those opinions are released, as well as for all future merits cases going forward.